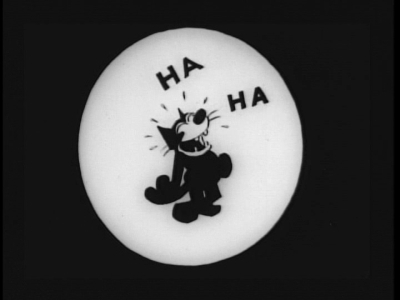 Before there were Looney Tunes, Merrie Melodies, or even Mickey Mouse, there was Felix the Cat. The black-and-white feline with a detachable tail was a superstar of the silver screen during the 1920s, who appeared in hundreds of popular cartoon shorts, sold thousands of tie-in products, and even became a mascot for British royalty. Felix's popularity waned during the 1930s, but he later had a comeback on TV, and his image is still a recognizable pop-culture staple. Like many old Hollywood icons, Felix has somewhat obscure and murky origins. Officially, Felix is the creation of an Australian named Pat Sullivan, a cartoonist, chronic alcoholic, and sometime jailbird, who operated an independent animation studio in New York City. Sullivan's studio was churning out a popular Charlie Chaplin cartoon series, when, in 1919, he got a request from Paramount Pictures to make a one-off cartoon that could be shown along with newsreels and travelogues. According to Sullivan, he went straight to his drawing board and came up with a simply drawn cat with a big personality that he claimed was inspired by his wife's love of stray felines (Other Felix origin stories the loquacious Sullivan told through the years included that Felix was based on a Rudyard Kipling story or a stray cat that wandered into the studio). 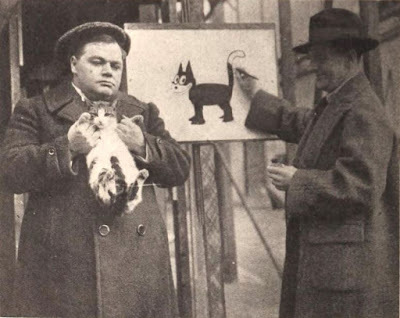 Animator Pat Sullivan uses feline star Ethel as a model for a drawing of Felix the Cat. Ethel is being held by comedian Roscoe "Fatty" Arbuckle. However, most film historians credit Sullivan's lead animator Otto Messmer with the creation of Felix. According to Messmer, a quiet, self-effacing man who never spoke about Sullivan until after his boss' death, Sullivan was extremely busy at the time of Paramount's request, so he passed the project to Messmer by saying "do any little thing that will satisfy them." Messmer, who had a reputation for creating both visually and verbally inventive cartoons, quickly got down to work on "The Feline Follies of 1919," a fast-paced, surreal cartoon that featured a Felix prototype called Master Tom. Whoever invented Felix, the character achieved almost instant popularity. Paramount executive John King requested a second cartoon and then an entire series, and he also asked Sullivan to change Master Tom's name to Felix. Paramount stopped distributing cartoons in 1921, but Margaret J. Winkler, a canny former secretary for Harry Warner with a good head for business, soon picked up the series as an independent distributor. Winkler had a knack for promotion, and soon Felix's grinning visage was adorning everything from dolls to Chevrolet ads (the owner of a Los Angeles Chevy dealership happened to have the fortuitous name of Winslow B. Felix). 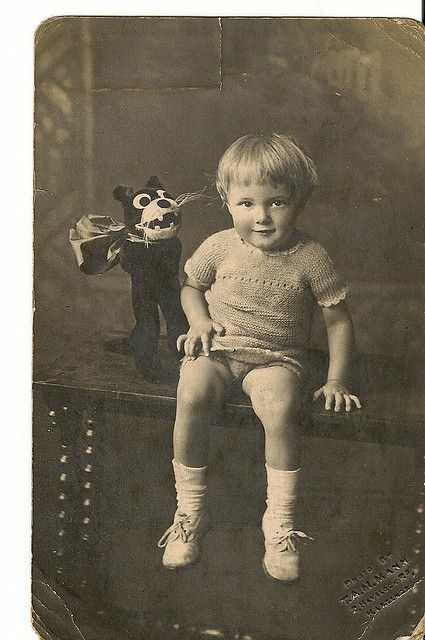 A child poses with a Felix the Cat doll. Felix even became a popular mascot for jazz age celebrities: Charles Lindbergh posed for photographers in a Felix-adorned plane, Ziegfeld Follies star Ann Pennington "taught" Felix the black bottom in a newspaper promotion, and the dashing Prince of Wales (the future Edward VIII) made Felix the mascot for his polo team. Even the United Kingdom's stuffy King George V was a closet Felix fan (his wife, Queen Mary, bought him a Felix doll). Most notably, the cartoon cat became a TV pioneer when RCA broadcast a Felix doll as part of an early TV experiment. However, like many a movie star before and since, Felix's crash was even more spectacular than his rise. The arrival of sound cartoons didn't phase either Messmer or Sullivan; "Felix was going so good, we thought, why change," Messmer remembered. However, audiences soon began flocking to movie theaters to see sound cartoons produced by an ambitious Midwesterner named Walt Disney, whose signature character was the Felix-esque Mickey the Mouse. Messmer did attempt to make a few Felix cartoons with sound, but the rise of talkies also coincided with a change in Sullivan's fortunes. His beloved wife, Marjorie, died in 1932, and he sank into an alcoholic depression and died of his addiction on Feb. 17, 1933. 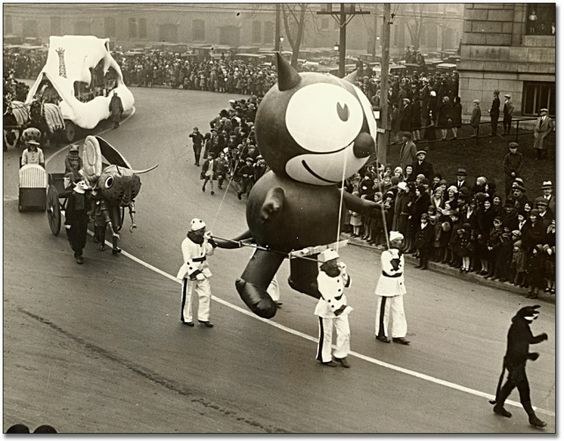 A Felix the Cat balloon in the Macy's Thanksgiving Day Parade. This photo was taken between 1932-1941. There was an unsuccessful attempt to revive Felix during the 1930s, and Messmer continued drawing a Felix comic strip and Felix comic books for the next two decades. Animator Joe Oriolo brought Felix to a new generation in 1953, when he struck a deal with Sullivan's nephew to create a TV series. Oriolo made Felix more kid friendly with rounder features and magic bag of tricks, and the black-and-white mischief maker became a beloved part of many baby boomers Saturday mornings. Today, Felix has been overtaken in popularity by other cartoon cats, but he is still a recognizable pop-culture figure, with his own website (www.felixthecat.com) and an appearance in a Dr. Pepper commercial (clip below). Classic movie streaming service The Film Detective recently added several twenties Felix cartoons to its roster of classic cartoons that includes Betty Boop, Superman, and Popeye. I had the chance to view several of the Felix cartoons and they are a delight that will appeal to both classic-movie fans and cartoon aficionados. (Note: some of the Felix cartoons do contain racial stereotypes, alcohol consumption, and risque humor, so parents might want to preview them first). Here's a little bit more info about three of the Felix shorts available at The Film Detective. The highlighted text will take you to a link to view the cartoons. The search for food was one of the standard themes of Felix cartoons like Eats Are West, which shows a broke Felix in search of his next meal. This cartoon is a great example of both Felix's kinship with Charlie Chaplin's Little Tramp character and the surrealism of the cartoons. 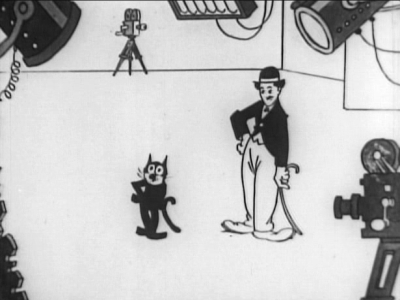 Felix the Cat and an animated version of Charlie Chaplin in Felix in Hollywood (1923). A must for old Hollywood fans, this cartoon finds Felix traveling to California with a ne'er do well actor by transforming himself into a suitcase. Felix tries to get a job at Static Studio where he meets comedians Ben Turpin and Charlie Chaplin and saves swashbuckling star Douglas Fairbanks from a swarm of deadly bees (I'm not exactly sure what the flying creatures are supposed to be, but I'm a The Swarm (1978) fan, so I'm gonna go with bees). The Felix cartoons often captured the Roaring Twenties zeitgeist by dealing with hot topics such as the theory of evolution and labor disputes. However, Felix's most popular subject was Prohibition with the mischievous cat consuming illegal hooch in more than one cartoon. In Felix Finds Out, the feline is helping his young owner with a homework assignment about the source of the moon's light when he stumbles on some potent home brew. My sources for this article are Felix: The Twisted Tale of the World's Most Famous Cat by John Canemaker and Hollywood Cartoons: American Animation in its Golden Age by Michael Barrier. Thanks for sharing. It's nice to see young people involved with classic movies. This is a really nice article! You have a lot of great detail. This is really interesting history! Thanks so much for your kind words about the article and your invitation. I'm up to my neck in work right now and won't be able to join your blogathon, but I appreciate the invite and wish you good luck. That's perfectly fine. I hope that all things go well for you with your endeavors. By the way, I would like to invite you to join a blogathon which my sister, Rebekah, is hosting in November. On November 9-11, PEPS is hosting the Claude Rains Blogathon in honor of this marvelous actor's 129th birthday on November 10. You can read the announcements and sign up here: https://pureentertainmentpreservationsociety.wordpress.com/2018/10/02/five-minutes-everybody-the-curtains-going-up-on-the-claude-rains-blogathon/. You probably will be too busy to join, but I wanted to ask you just in case.